The first part of this report examines individuals’ online news tendencies over the course of one week. To do this, as indicated in the illustration below, the frequency of each respondent’s behavior was calculated as a percent of all the times he or she reported getting news online. For example, if someone got news 10 times, and did so through social media three of those times, that person got news through social media 30% of the time. Researchers then combined the figures for all 2,004 online news consumers and calculated the average rate of each behavior. Past research by Pew Research Center revealed that the way Americans find digital news can impact the overall news experience. This study delves further by examining pathways used over the course of a week as well as which ones tend to be associated with other news habits such as sharing or source recall. The study asked about five separate pathways: news organizations’ websites and apps; social media; search engines; emails, texts and alerts from news organizations; and emails and texts from friends or family. Each mini-survey asked online news consumers to indicate any and all pathways used to get news about the topic they got most in the past two hours. Overall, social media and news organizations’ websites and apps were used far more than the other three. On average, 36% of the times individuals got news online, they did so by going directly to a news organization’s website or app. That’s about the same rate at which they got news through social media (35%). Less common was getting news through search engines (20%); through emails, texts and alerts from news organizations (15%); and through emails and texts from friends or family (7%). In addition, most people tended to favor one pathway over the others. 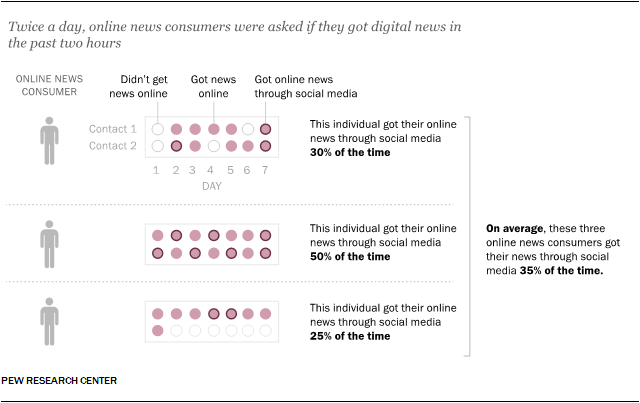 About two-thirds (65%) of online news consumers got news through the same pathway more than half of the times they got news.1 Again, social media and news organizations’ websites and apps were the most common. About a quarter (26%) of online news consumers consistently got news through social media, and about the same portion (23%) did so from news organizations’ websites and apps. 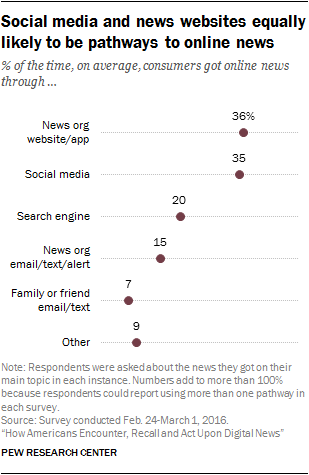 Less than one-in-ten consistently got news through search engines (8%); through news organizations’ emails, texts and alerts (7%); or through the emails and texts of friends or family (1%). The remaining 35% of online news consumers did not have a preference for one of the five pathways asked about – either grazing across pathways or using some other means of finding news, such as through a news aggregator or browser home page. A later section shows how the pathway can impact the way individuals engage with that news. As for the topic of the news, politics was by far the most popular during the week studied (Feb. 24 to March 1, 2016), which came at the height of the presidential primary and included Super Tuesday. On average, 40% of the times people got news, government and politics was their primary or only news topic (i.e. their main news topic). All other topics fell far behind, with entertainment, the next highest, at just 16%. No other topic – including community, business and finance, or sports news – was the main topic more than 10% of the time. On average, when consumers got news, it was about just one topic 47% of the time. They got news on two topics a quarter of the time on average, and on three or more topics 28% of the time. However, over the course of the study, respondents reported getting fewer topics, which might be in part due to asking the survey multiple times over the week. In this era of shared news, many have questioned the degree to which people are aware of the actors (traditional media organizations and otherwise) that produce the news they get online – particularly when news is shared via links and often not identified with the brand name in the same way as on a news site. This weeklong study reveals that when individuals followed a link to a news story, they were more often than not able to associate that link with a particular news source.2 If they had followed a link, individuals were asked to name the specific news outlet(s) they were taken to. On average, online news consumers named a source 56% of the time. 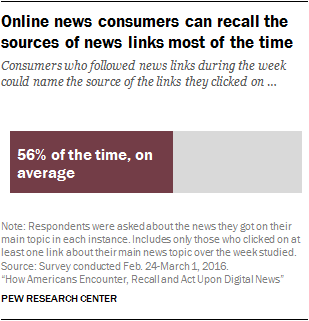 Still, this means that a little less than half of the time someone followed a news link (44% on average), he or she could not remember the source. And, as discussed later, where the link comes from impacts recall. The source names provided reveal a wide range of outlets that people linked to and also showed that some identified the social media site Facebook as a specific news outlet. CNN was named at least once over the week by 14% of those who followed links, similar to the 12% who named Fox News and 10% who named Facebook, even though Facebook does not produce the news stories distributed on the site. An additional seven sources were named by at least 3% to 6% of those who clicked on links: The New York Times, The Huffington Post, MSNBC, Yahoo, ESPN, The Washington Post and CBS. No other individual source was named by more than 3% of those who clicked on links. Some of this is perhaps tied to the fact that most of those who frequently click on links return to the same sources, showing loyalty to specific outlets. When asked to provide the name of a link’s source, nearly six-in-ten (59%) of those who frequently clicked on links named at least one news outlet multiple times during this week. While this is self-reported data and the survey did not allow for verification of the sources named, the high rate at which individuals indicated that they did not remember (44%), as well as the wide range of sources named, suggests at least an intention to honestly answer the question. One feature of the digital news experience is the ability to respond to the news in a number of ways, both online and offline. The survey asked about six different types of follow-up actions: speaking with someone either in person or over the phone; searching for additional information; posting, sharing or commenting on a social networking site; sending an article to someone by email or text message; bookmarking or saving the news for later; and commenting on a news organization’s webpage. Online news consumers in the study were about as likely as not to take some kind of action in response to the news they got, acting upon news 52% of the time on average, and not acting upon it 48% of the time. Speaking with someone in person or over the phone was the most common action to take, occurring 30% of the time on average (as noted in an earlier report). Among the digital actions, the most common one was personal, rather than social: Searching for more information occurred 16% of the time, on average. That was followed by two social actions: posting on social media (10%) and sending the news story to others via email or text (5%). Individuals saved a news story for later 4% of the time on average (though other research indicates that many never go back to stories they save for later), and commented on a story just 2% of the time. Past studies have found a strong incidental nature to the digital news experience – finding news mixed in with other online activities, rather than specifically seeking it out. This study probes more deeply to examine the extent to which people happen upon news online while in the midst of getting other news – for example, stumbling across entertainment news while already reading an article about business. This could come through prompts on websites, links within news stories or as a result of additional searching. The findings reveal that consumers do occasionally come across news while already getting news about something else. Nearly a quarter (24%) of the time, on average, people learned about their main topic of news after getting news about another news topic. 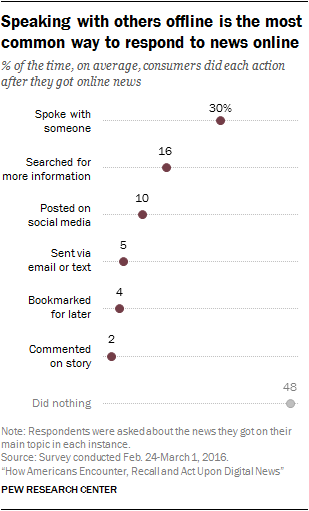 But that was less often than purposefully seeking news out (39% of the time on average) or happening upon it while doing something else online (36% of the time). Consistent with previous findings, younger online news consumers are more likely than older ones to get news through social media. On average, 18- to 29-year-old online news consumers got their news through social media 47% of the time, about double the rate of those 50 and older (23%), and about on par with those ages 30 to 49 (42%). 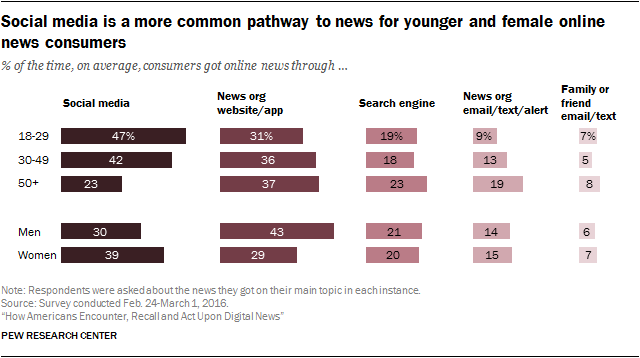 The one pathway in which older online news consumers (those 50 and older) stand out, on the other hand, is news organizations’ emails, texts and alerts. The other three pathways were accessed at about the same rate by all age groups. Looking at gender, women who consume news online got news through social media somewhat more often than male online news consumers – 39% versus 30% of the time, on average. Younger women particularly stand out. Women ages 18-29 and 30-49 got news through social media about half of the time on average (47% and 49%, respectively), compared with 28% for women 50 and older. Men, meanwhile, stand out for a greater tendency to go directly to a news website or app. 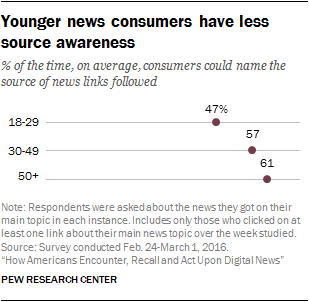 Even though younger and older online news consumers follow links at about the same rate, younger adults are less likely to remember the source of these links. When 18- to 29-year-old online news consumers clicked on news links, they remembered the source about half the time (47%), at least 10 percentage points less than their elders (57% for 30- to 49-year-olds and 61% for 50 and older). In addition, the oldest online news consumers are the most loyal. Among those who followed news links three or more times in the week, 74% of consumers ages 50 and older named at least one source multiple times, compared with half of those ages 18 to 29 and 30 to 49. There was no difference between genders in the extent to which they remembered the source of news links. When it came to loyalty, though, men who followed news links at least three times were more likely than women to name at least one source multiple times (66% vs. 52%). 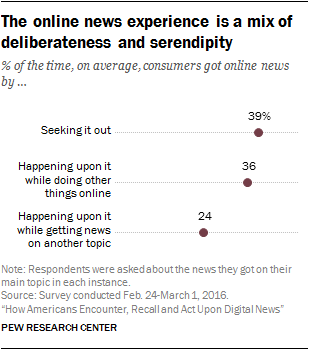 Older online news consumers are somewhat more deliberate in how they get news. 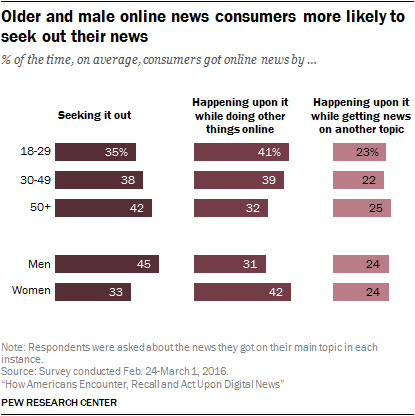 On average, consumers ages 50 and older sought out their news 42% of the time, more often than those 18 to 29 (35% of the time), but on par with those 30 to 49 (38% of the time). Additionally, men tended to be more deliberate than women in how they get news online. Men sought out their online news 45% of the time, compared with 33% for women, on average. There were no notable age or gender differences in the frequency or type of action taken after getting news.